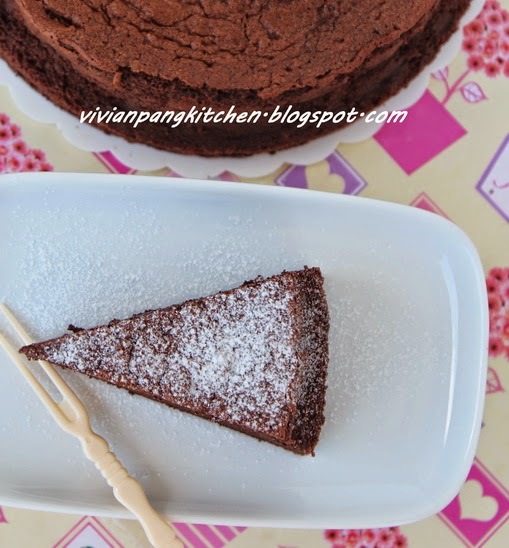 This recipe remind me of my previous bakes, Chocolate Almond Torte . This time I want to bake by using Belgium chocolate that I used in making Chocolate Mousse Cake. I omit the almond meal as I prefer smooth texture. The sweetness of the whole cake is just right after reduced half the amount sugar recommended. I shared with friends and they love it! 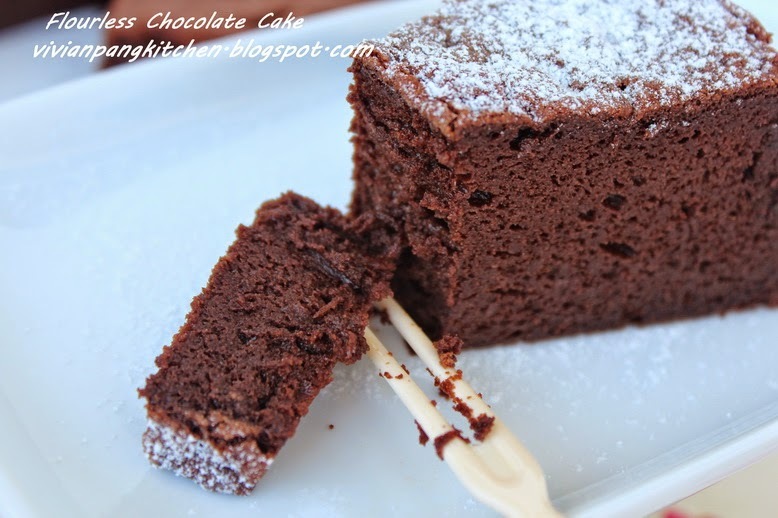 By the way who doesn’t love moist, rich chocolate cake? Happy baking! 1. Melt chocolate and butter in a bowl over a pot of hot water at low-medium heat (double boiler method). After melting all ingredients, remove from heat, stir thoroughly to combine. 2. Mix in ground almonds (if using). Beat in the egg yolks, one at a time. *Make sure the mixture is not too hot, as you don't want the egg yolks cooked at this stage. 3. In another bowl whisk the egg whites till frothy. Add vinegar and half of the sugar. Continue beat till incorporate. Add in the 2nd portion of sugar and continue beat till stiff and peaked. 4. Fold in a few spoons of egg whites into the chocolate mixture to lighten it. Gently fold in the rest with small amount at a time for 3 times just until all ingredients are incorporated. 5. Turn the mixture into a greased 20cm round baking tin (I greased the side and lined the bottom with baking paper). Bake in preheated oven at 130C for 40 to 50 minutes. Insert a cake tester to test the cake. If the tester comes out clean, it’s cooked through. *Adjust the oven temperature accordingly. 6. Remove from the oven and let it cool completely on a wire rack. *The cake will sink after cool and it is normal for flourless cake. *If keep chilled, it is best to eat after 10-15 minutes at room temperature. Hi Vivian! 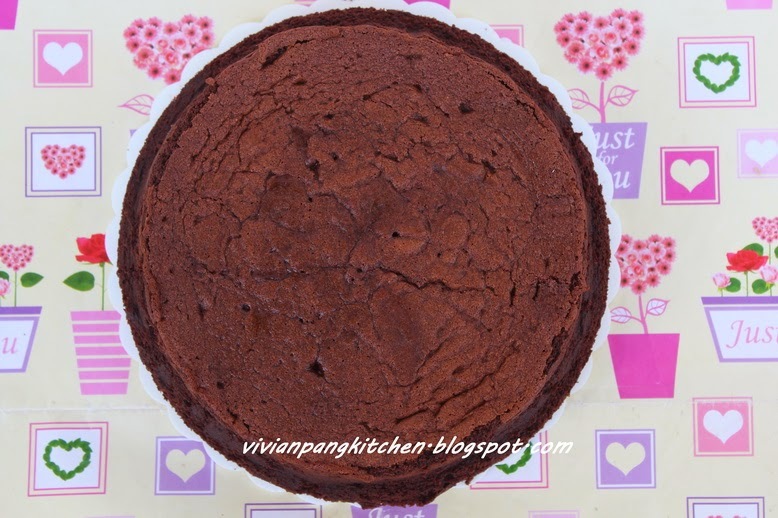 I have tried flourless chocolate cake and I love it a lot! Must be a really rich cake... lovely! 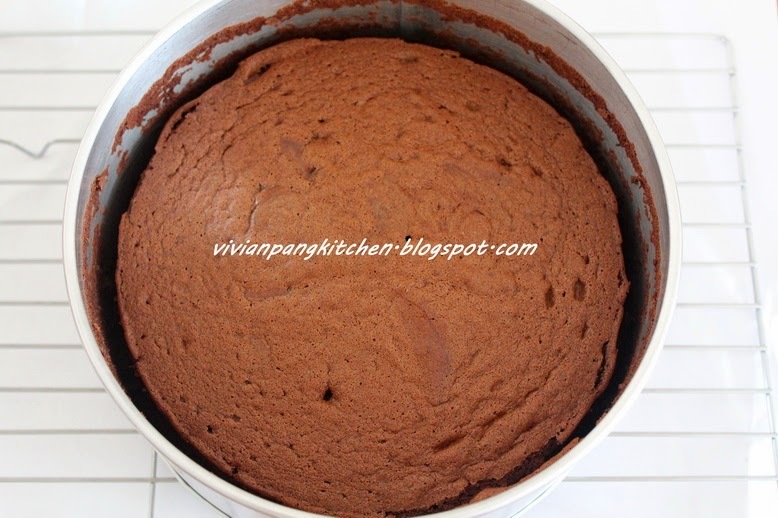 Vivian, this chocolate cake texture looks so moist! Love the cake that is not too sweet! I have tried baking cakes without flour and it was a total surprised how delicious the cake is especially with nuts flour. And yours sounded as incredible. Enjoy & have a fabulous week ahead.